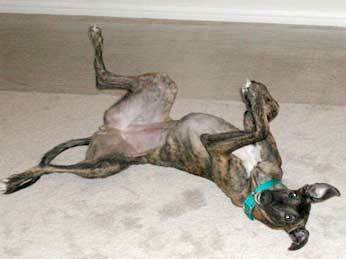 Zenny, aka Sakkara Zenny, is a 2½-year-old dark brindle female. 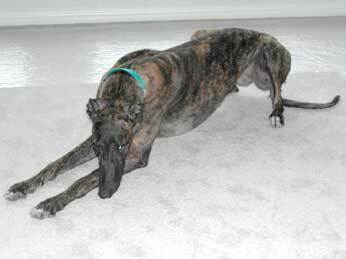 Zenny is very personable, sociable and outgoing. She has mastered the stairs, is energetic but very easy going, loves to play tug of war, chase, and just roughing around with her foster mom's other dogs. She has learned how to lay down. 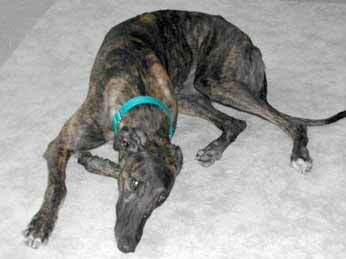 Zenny would make a wonderful courser, as she loves to run! She is also the class clown and will make you laugh, especially with her "smile"! Her foster mom says, "She, I have to say, is by far the best dog I have had yet to foster. Her eating habits are neater, she doesn't leave a big puddle of water like she used to. She sips instead of taking big globs of water. She is so funny."